For those looking for an idyllic, beach-based getaway, Talamanca is the perfect place. 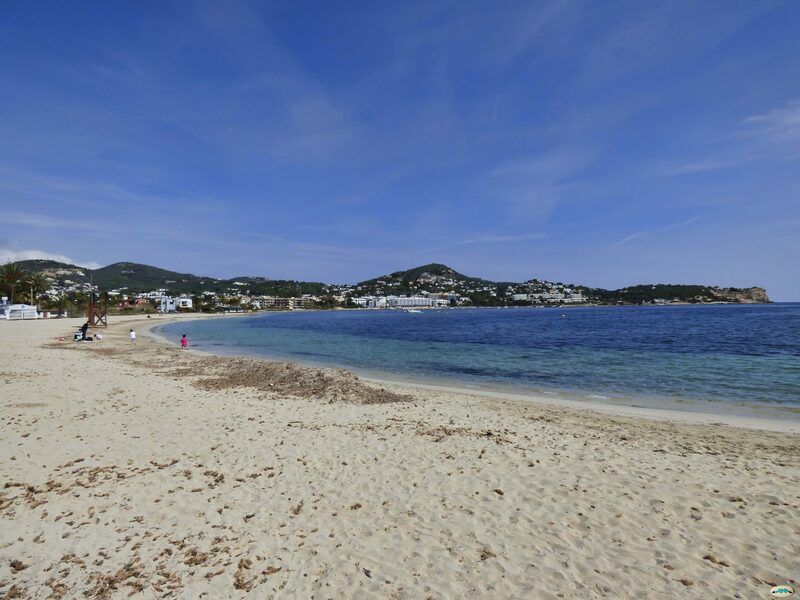 Located on the south side of Ibiza, only 15 minutes walk from Ibiza Town, Cala Talamanca may not be the most scenic beach on the island, but it is long and wide and has a rustic charm all of it’s own. It’s also able to accommodate a large number of sunbathers so it’s a good choice if you’re not keen on being too close to the next sun worshipper. The beach is covered in soft, golden sand and shelves gentle in to the shallow water so it’s a great spot for a gentle swim and safe bathing in general. There are limited opportunities for watersports as the resort is not as fond of activities as some of the others around the coast. A wooden promenade runs the length of the beach, which is a lovely place for a sunset stroll, particularly as it is lined with bars and restaurants which offer amply opportunity for pit stops for cocktails. Talamanca is one of the only resorts that is pretty much open all year round and you’re as likely to find some fresh seafood and a chilled glass of wine in November as in the heat of August. The same is true of the hotels in Talamanca, many of which are open even out of season. The hotels at the front of the resort have fantastic views out over the sea and the small resort has some of the most luxurious accommodation in Ibiza. There are hotels with spas, chill out bars and every luxury you could possibly ask for, as well as hostels with stunning panoramic sea views. Part of the reason these hotels have sprung up in Talamanca is the little beach resort’s proximity to Ibiza Town – it’s almost as if it acts as the beach that the bustle capital doesn’t have. Talamanca has it’s fair share of shops and restaurants but it is not as well catered for as some of the largest resorts, which for some people can make it seem like an inconvenient place to stay. The up side of this inconvenience is that it is less crowded and less manic than some of the other resorts on the island. The little village of Jesus is only a 15-minute walk away, which offers another lovely selection of cafes, restaurants and bars. Talamanca itself has a small but spritely nightlife that won’t overwhelm you but won’t keep awake all night either, with the beachside Talamanca restaurant in particular proving very popular, particularly at fiesta time. One of the best features of Talamanca is its proximity to everything. Just a quick ferry ride or walk away is Ibiza Town with its myriad of restaurants and bars and prime shopping spots. If you’re looking for a high end experience, the chic bars and boutiques of Ibiza Town marina are just a short trot along the beach, along with some of the most stylish restaurants (all of which have a fantastic view of the ‘wet set’s’ million pound yachts). If you’re looking to go clubbing in Talamanca itself then you’re likely to be disappointed, but fear not as every resort on the island is reachable by bus or boat and you are so close to Pacha in Ibiza Town that it’s not even an inconvenience. The smart (and the stylish) breed of clubber will spend all day soaking up the rays on Talamanca beach before hopping on the ferry over to Ibiza Town, partying until dawn and then walking back barefoot over the golden sand at sunrise.